Whole30 is completed! We are done and there was much rejoicing. I’m ready to do some baking again. These 30 days have actually gone by quickly and the overall experience has been pretty fun, dare I say. Reminder: Who exactly is doing this challenge? My husband and myself and our 16 month old and 3 1/2 year old. The kids are eating what we eat for the most part but the 16 month old still eats oatmeal for breakfast (no dairy in it though) and on occasion a rice cake. The 3 year old has an option of oatmeal for breakfast, but she’s only had a couple of bites. She used to love oatmeal, but it just hasn’t been her thing lately. Okay, so we all felt great again during the last part of our Whole30. The big difference for me though, is that the last week I’ve just been ready to be done! Weeks 2 and 3 I really didn’t think about off plan foods. This past week I have! Peanut butter, cheese, baking, oats, chocolate, beans are just a few of the things that have been filling my mind. Physically I’ve been doing great though and have had enough energy to get through my to do lists even on little sleep. What’s the plan going forward? I’m looking forward to incorporating legumes and cheese back into our diets. We will also add back in grains and wheat but hope to limit the quantities. We’ll also be watching how our bodies respond to these foods more closely now and hopefully adjusting as we need to. 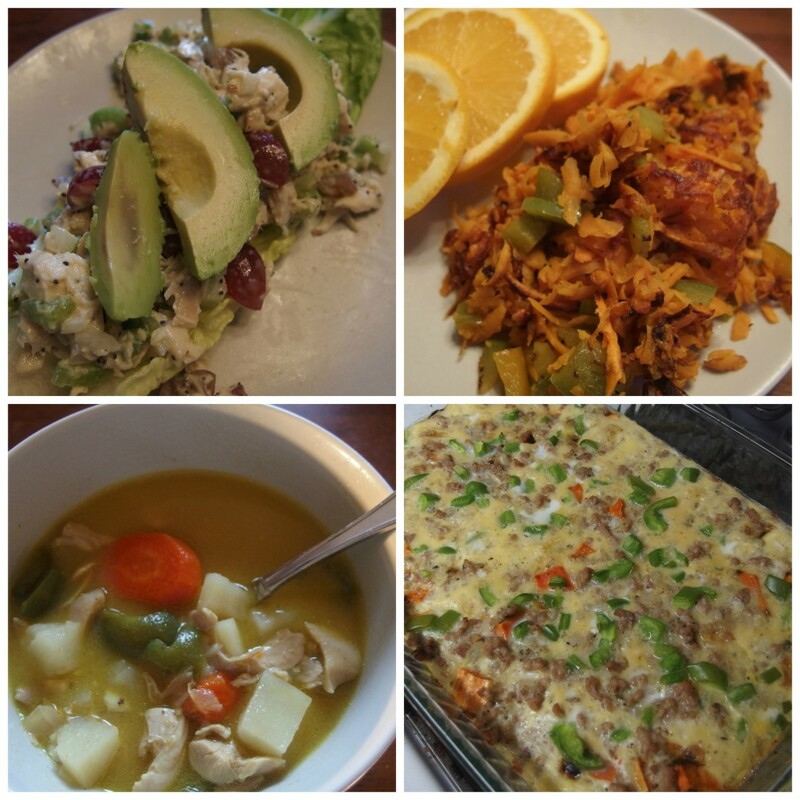 Breakfasts: for the last 9 days we ate leftover sweet potato breakfast casserole (still my favorite), scrambled eggs, hash browns (made from sweet potatoes is my other favorite breakfast food), and scrambled eggs and veggies baked in muffin tins. Lunches: The trends from the first weeks continued and Shaun and I had salads while the kids had leftovers or sweet potatoes for week day lunches. We also had Rosemary Chicken Salad served on lettuce and Paleo Sweet Potato Chili. Suppers: We had a Ginger Beef/Broccoli/Carrot stir fry type thing, Chicken Curry Soup, Chicken and Veggie Soup, Crispy Chicken Thighs (recipe coming this Friday), and leftovers of all the above. Leftovers rock! I’ve been spending way more time in the kitchen for breakfasts and lunches than I normally do, so leftovers are a life saver. Number wise, over the last 30 days I lost 10 pounds and 1/2-1 inch on my thighs, hips, waist. I have also spend the past 30 days exercising 5 days a week – power walking with the double stroller and doing 10 minutes of pilates, so I’m sure it has been a combination of the two. 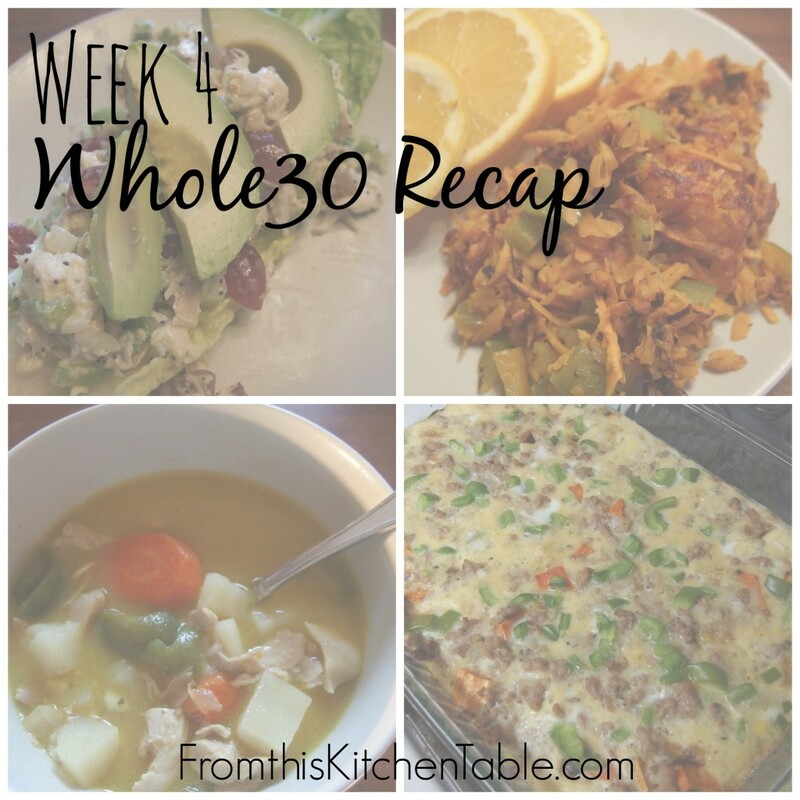 And that’s our last Whole30 recap! Even though is has been time consuming, expensive, and a little hard with social events it has been good and worth it! This entry was posted in Uncategorized on October 7, 2014 by Deanna Michaels. I’ve been seeing a bit about the whole30 challenge lately and am quite intrigued. Our 2 daughters (1 Exclusively Breast Fed) both suffer from medium-bad eczema and I do wonder if a cleanse like this may help them… or at least reveal any allergies. It does seem like there are a lot of people doing Whole30 lately! I’ve been meaning to for over a year and just got around to it. Eczema is no fun! My 17 month old had it on both cheeks when he was younger, thankfully that went away and he just has a few spots on the back of his legs and trunk but they are much milder. We cut out wheat early last spring to see if it would help, and I think it did make a difference – didn’t clear up 100% but it was much less. Thanks for taking us along with you on this journey. I really need to try that sweet potato breakfast cassarole as we’re digging up our sweet potatoes this week. Hope to see you again at Simple Lives Thursday this week . We love the casserole! I bought the stuff to make it again this week. How awesome you grew your own sweet potatoes! A garden is on my wish list for someday. 🙂 Thanks for hosting! It was quite the 30 days! Then we went to TX for one of my sister’s wedding and blew it all. 🙂 We are back home now and I did a grocery run yesterday so hopefully we can find a new balanced normal that we can sustain long term! We’ll see how it pans out.